Kiluan Bay is located in Kelumbayan district, Tanggamus regency, Lampung. If you love Dolphins, this place will be the perfect one to be visited. In the world, there are only limited locations to see wild dolphin encounter. If you cannot go to Tangalooma Moreton Island in Australia to see wild dolphins, the other best option is to go to Kiluan Bay, Lampung, Indonesia. Along the way, you will pass through many scenery locations, from Klara coast to green hill with a beautiful ocean to get to the location in Kiluan Bay. The best time to see the dolphins is at 6:00 am, because the sea wind and wave still calm and the dolphins are still in their habitat around the Sunda Strait. The travel time is about one hour by fishermen’s boat called Jukung, with two to three passengers, toward to the middle of the Hindia Ocean. When you get the dolphins area, it doesn’t take long time for tourists to see marine animals swim freely. 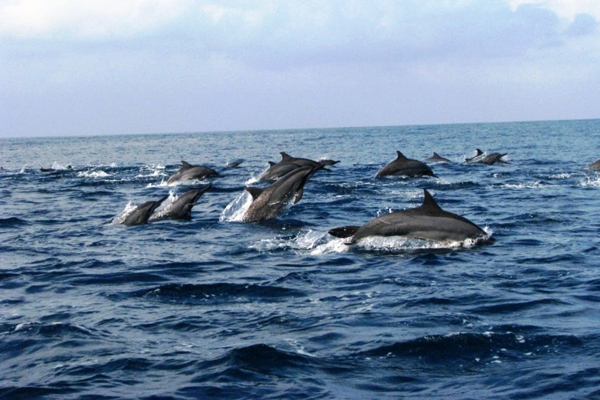 Kiluan Bay is functions as a migration path for two species of Dolphin; the Bottle-nose dolphin and the Spinner dolphin. The number of these amazing marine crease that pass through the bay is estimated in the thousands, one of the largest number of migrating dolphins in the world. Beaches around the bay are also nesting grounds for two species of sea turtle; the green sea turtle and the hawksbill turtle. Dolphins at Kiluan Bay can be seen weaving their way between the waves just 20 minutes from the coast. A variety of boats can be chartered from the locals to take you out to sea, such as the bercadik – a small boat that carries a maximum of 3 guests plus 1 guide / boatman. Going to Lampung is about 25 minutes away by plane from Jakarta. There are more than 15 flights a day serving Jakarta – Lampung. The distance from Lampung’s capitol Bandar Lampung is about 75 km, about 3 hours journey by car. You can ride a motorcycle, or drive a car such as SUV, Jeep, or Van to explore the location there. Getting to Kiluan will take approximately 3-4 hours across winding and hilly trails. Some of the roads are not in good condition, so it is advisable to hire a large car for the trip. Roads may flood during the rainy season, so visitors should take note to travel during the dry season between April and September. Despite the roads’ inadequate condition, the calming sights of rolling hills and stretches of green paddy fields will help take your mind off the bumpy road.